I am writing to urge you to take action. 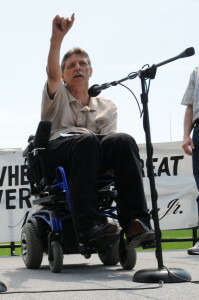 As you may know, NCIL has been working with ADAPT to organize actions around the country to save Medicaid. Amazing work has taken place over the last week. We have seen actions in several states and in DC. We have seen unprecedented media coverage of those actions highlighting the fact that this bill will harm – and kill – people with disabilities. This is our time! We have to act – and we have to act today! We need disability-led actions all over the country to bring attention to how the attacks on Medicaid will affect us. What we do today and tomorrow will most likely make the difference in this bill passing or not. What we are doing is making a difference, and we have to keep it up. I’m asking you to take action in your local community, take action in your state, and contact your Senators often. Hold actions in your Senator’s office, and if you can’t get there, hold actions in the local GOP offices. Just get out there and make sure our message is heard! There are a lot of groups protesting the bill for a lot of reasons, but our message is different because WE are the ones who will be most affected. Disability-led direct action helps bring focus to the issues of the disability community, and they are also much harder to ignore. This is what we need right now. As I write this, I am on Capitol Hill meeting with Senators in an effort to save the lives of people with disabilities. That’s where I was yesterday, and it’s where I’ll be most of the week, because this is serious! Our Senators need to know how serious this is for their constituents with disabilities. Our lives depend on the efforts of our community right now. You can visit the ADAPT website to find out about the actions already being planned. If you’re on Twitter, make sure to follow and join in at #ADAPTandRESIST and #SaveMedicaid! All of you are amazing, and I appreciate your efforts. As has been said many times, Justin Dart told us to get into politics as though our lives depend on it. This time they absolutely do! Once we get through this we have to go after EVV again. Nothing has so fundamentally undermined the independence, Privacy, self determination, and demedicalization that our movement has fought for than this. Geotracking, time-task reporting, being monitored by a faceless software program at a Healthcare corporation, not for better quality care, but to sniff out a negligible amount of fraud? We can’t save Medicaid and lose our liberties in the process.